Home+Made Archives - Pebbles, Inc. I don’t know about you, but sometimes January feels a little bit sad. There are no big holidays to celebrate, decorate for, or give gifts. This January, especially, we’ve had SO much snow and it’s been so super cold that we haven’t really even gone out much unless it was necessary. I decided to stop feeling down about it, and create something beautiful instead. So, I whipped up these little “snowflake themed” gift bags! 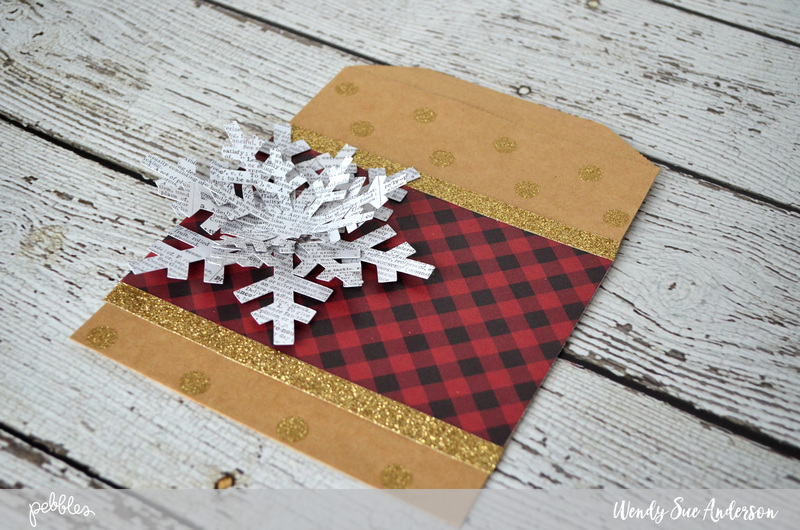 It was kind of a fun challenge to create a project that screamed “winter,” but not “Christmas.” I think I did it though – what do you think? These little bags will be fun to fill with a treat or a little gift to share with some of my friends who have also been “snow-bound” for the last little while. Start by gathering the supplies. 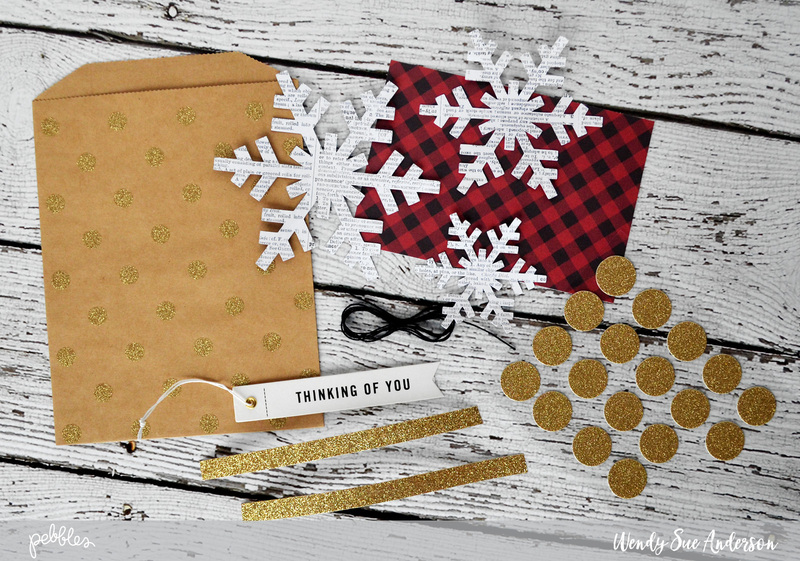 The polka-dot glitter gift kraft bags, the gold circle stickers, and the phrase tags are from the Home+Made collection by Jen Hadfield. 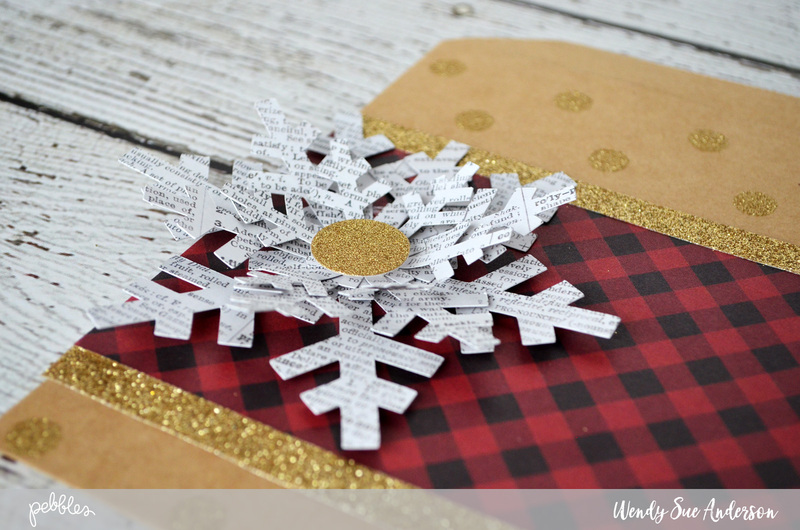 I cut the snowflake shapes from the “b” side of the “tweed” patterned paper from the “Warm & Cozy” collection using my Silhouette. 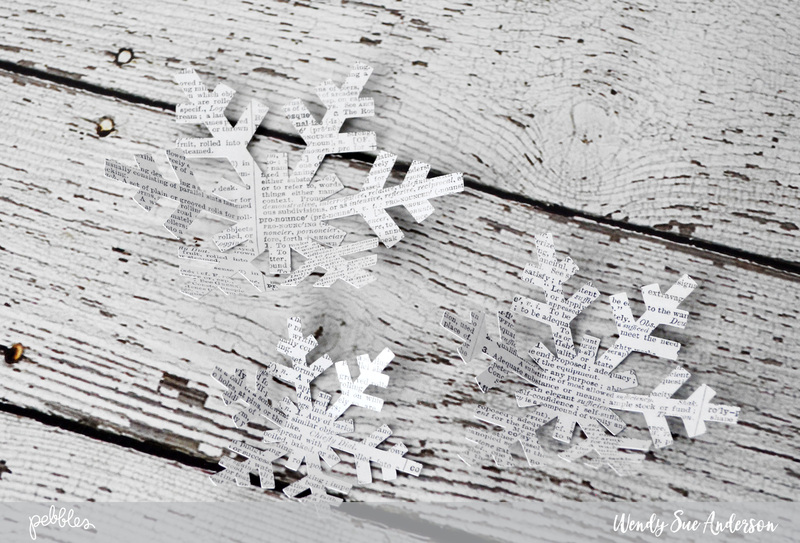 I have always been a fan of snowflake embellishments that weren’t just plain white – this text paper was a perfect choice for me. 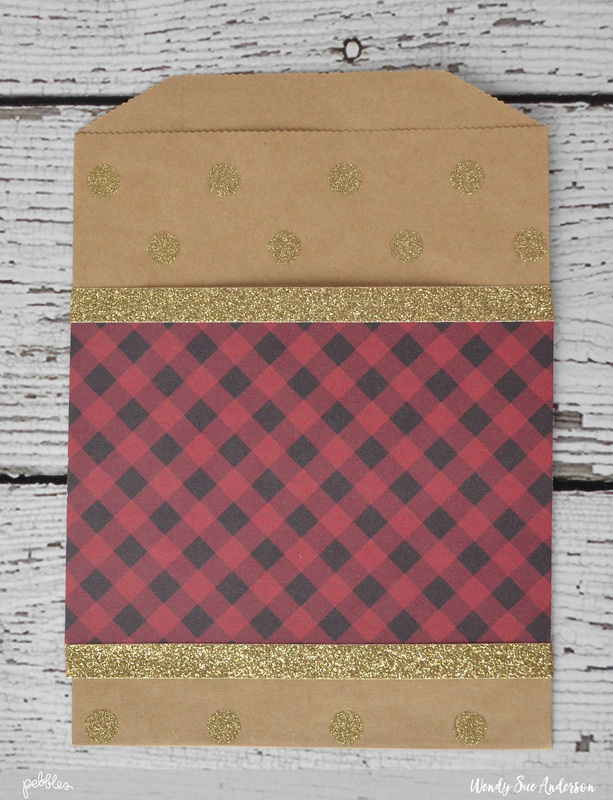 The buffalo plaid paper is also from the “Warm & Cozy” collection, it’s called “Antlers.” I also pulled some black twine and foam adhesive from my stash. The first step is to add the gold trim to the top and bottom of the plaid (it’s sticky on the back, so this is so quick!) paper. Place it on the bag front and secure with additional adhesive, and by wrapping the ends of the gold trim to the back of the bag. 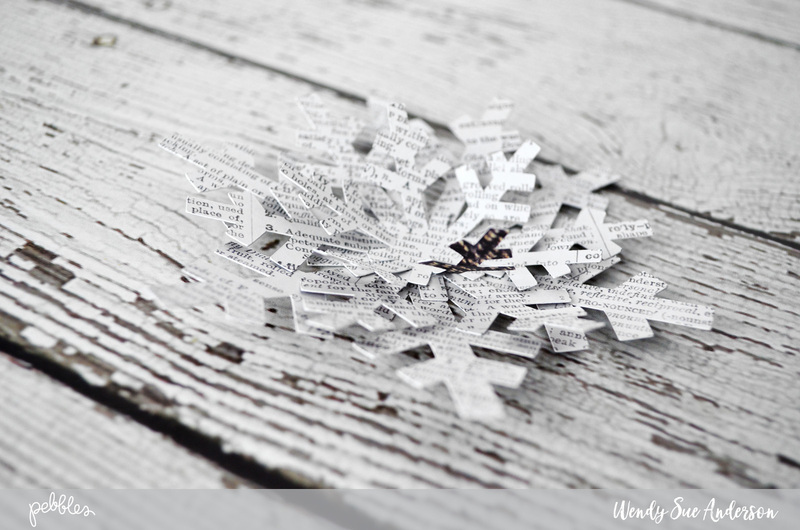 Next, “fluff” the snowflakes and layer them together. 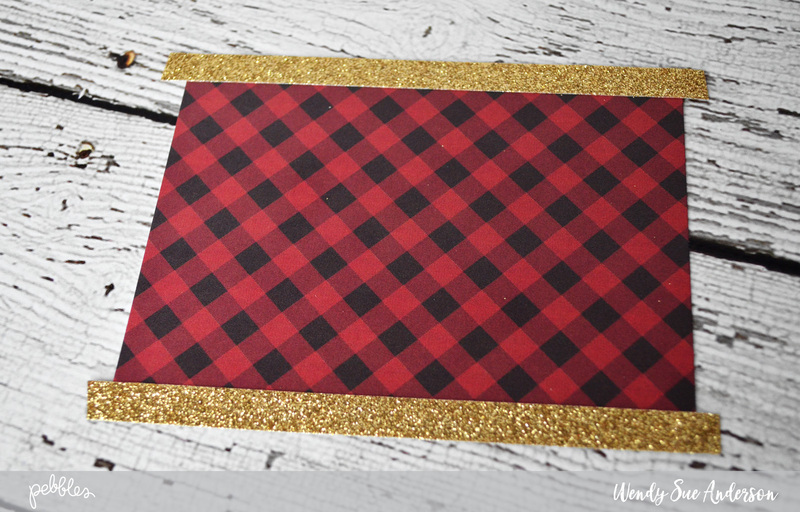 And add them to the left side of the plaid piece – I like mine to hang off the edge slightly. 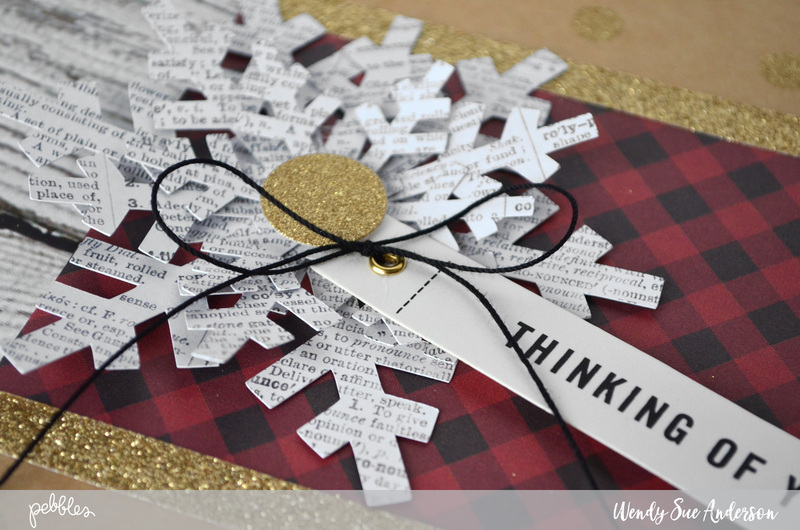 Use black twine or crochet thread to “connect” the snowflake center and the tag. Tie a bow! That’s it, now the bag is complete! And it is so quick and easy, you can whip up multiple bags in minutes! 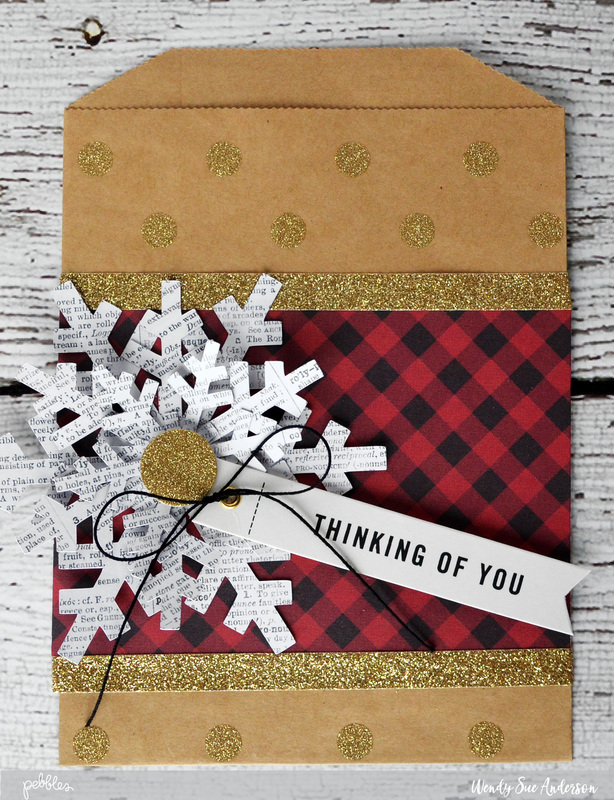 Add a little something to the inside and share the winter love! Thanks for joining us today – I hope you have a wonderful wintery day! Select the perfect cut of photos. I usually use 1 photo but today I mixed 4 photos layered together to make one. 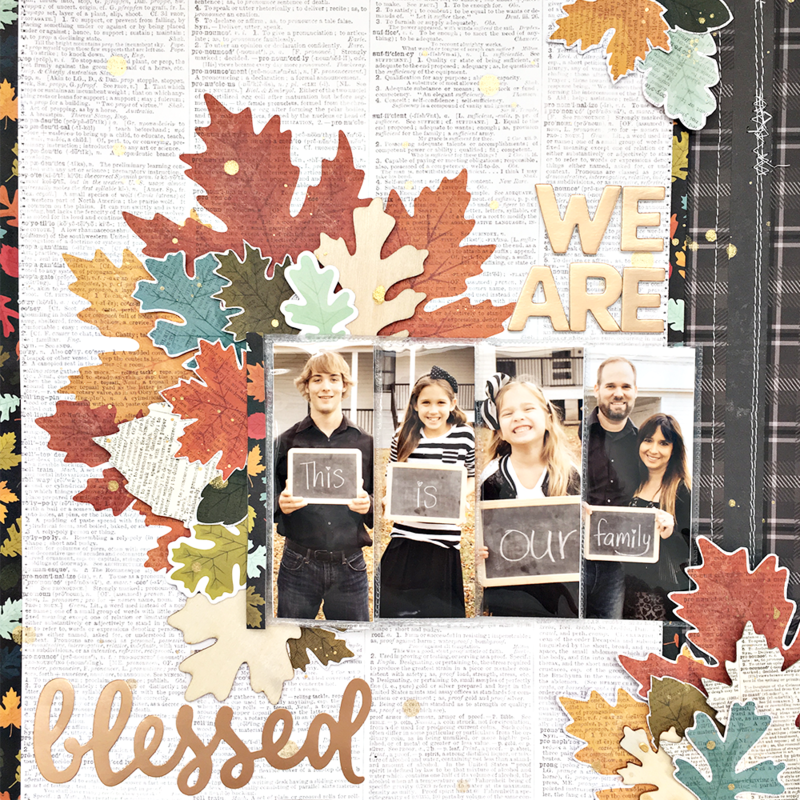 I used the recipe above to create this scrapbooking layout today. 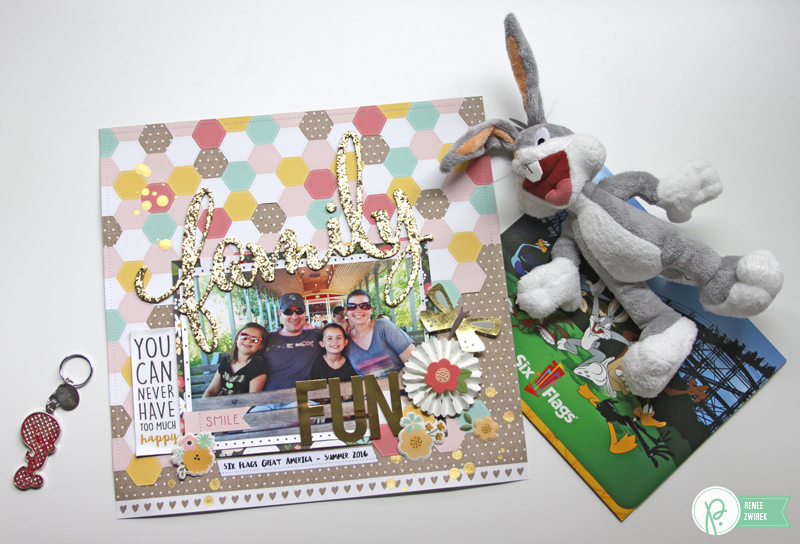 I hope you enjoy it and use it as a guide for your scrapbooking needs. I usually only use 1 – 2 photos on a page but because I know many Pebbles fans love to use multiple photos on a page, I thought I’d mix the two styles so that I could include multiple photos but only taking up the space of one. To do this, I used my Fuse tool to create a waterfall photo flip. 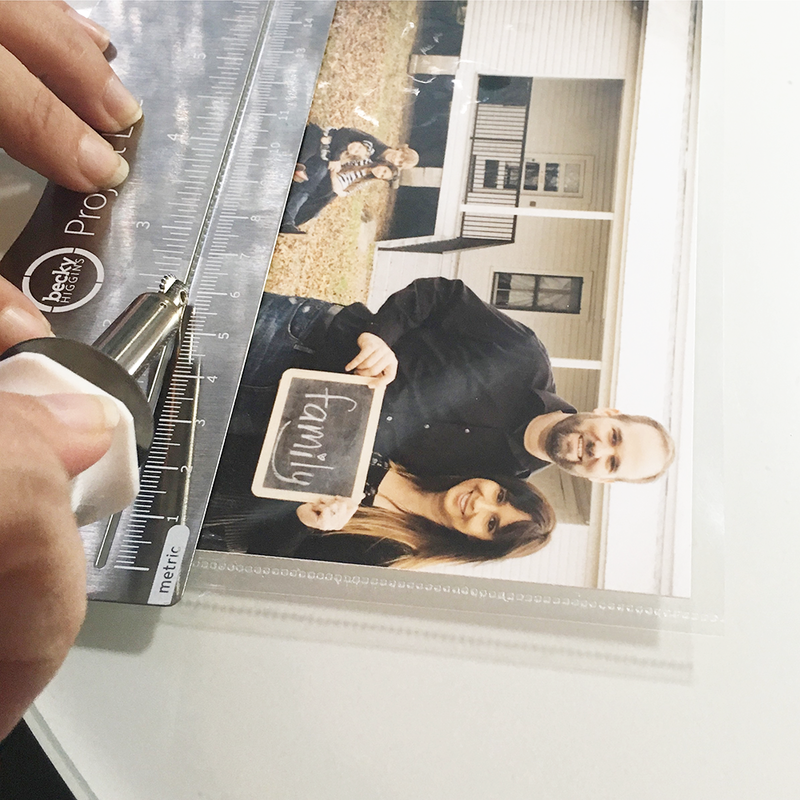 I simply printed photos in different sizes and used the fuse tool to make protectors sized to the photo. I layered the photos over each other so that each of my children’s faces and their word would show, with the last photo only revealing a photo of my husband and I and the last word of the sentence, which also serves as the main title. Next, I wanted to create a background of leaves but I also wanted to add some contrasting color so I trimmed my first pattern paper to 10″x12″ and added a small border using my 2nd pattern paper to the left side. For the right side, I combined those two patterns used on the left with 2 additional pattern papers, overlapping them together to make a larger border on that side. No layout of mine would be complete without stitching. For this layout, I stitched the seams of each border, leaving room to lift the paper just a bit. 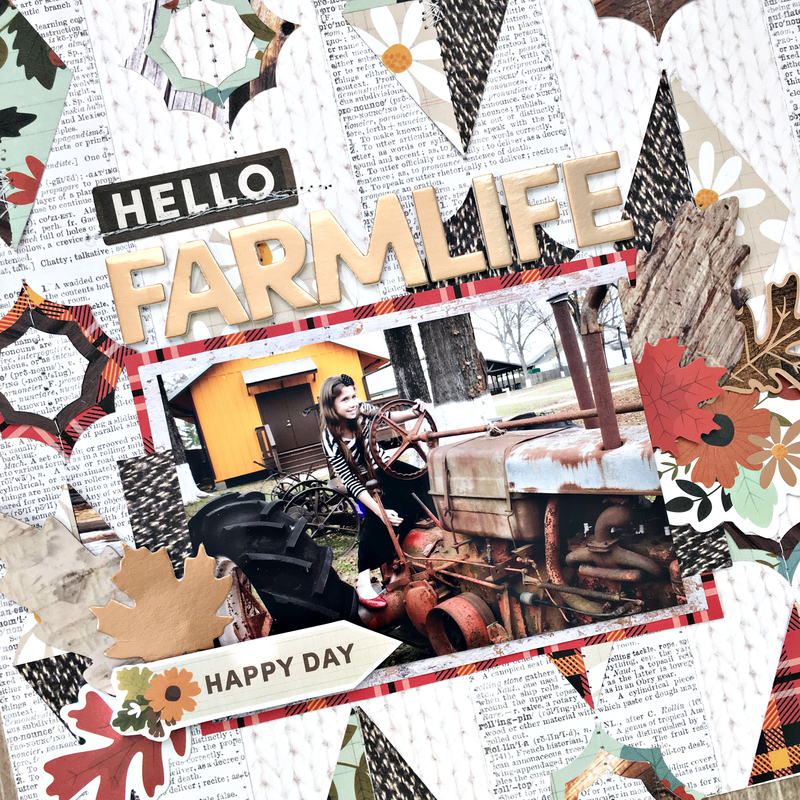 I used a combination of hand cut and die cuts leaves as well as wood veneer to add layers around my photo as well as to create the triangle visual design pattern around the page. I’ll admit, I almost never have a title in mind when I start creating. I wouldn’t recommend this but it’s what I do and almost always work out. 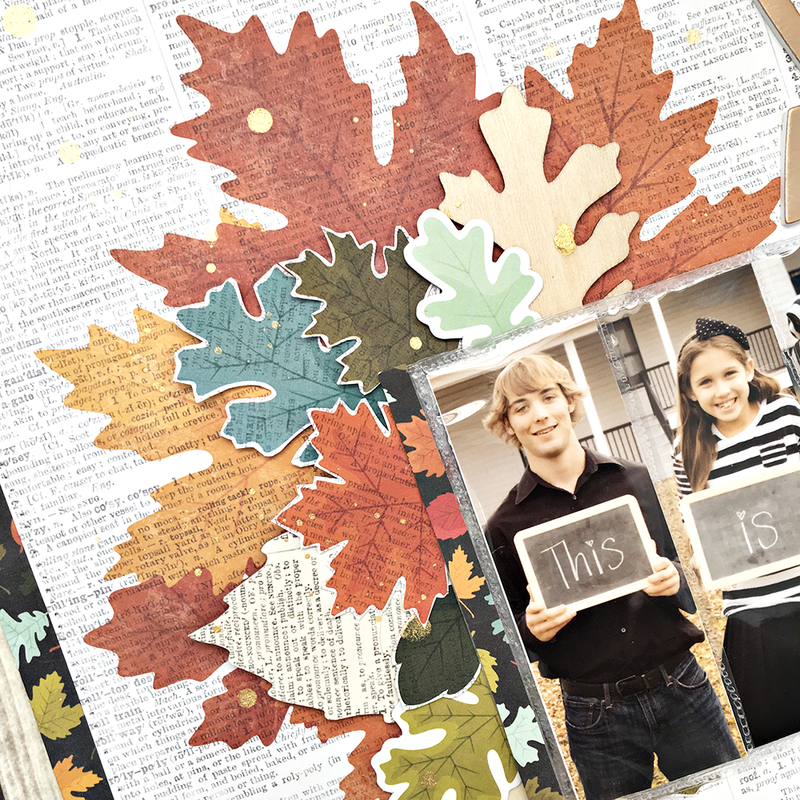 Journaling is a key component to a layout that you really shouldn’t go without. Although you may remember the story as you are creating it, you probably won’t remember those details years or decades from now and those who are looking at the pages in your album certainly won’t remember it or may not have even been a part of the story so please, please add an ounce or two of journling, even if it’s just the who, when and where. 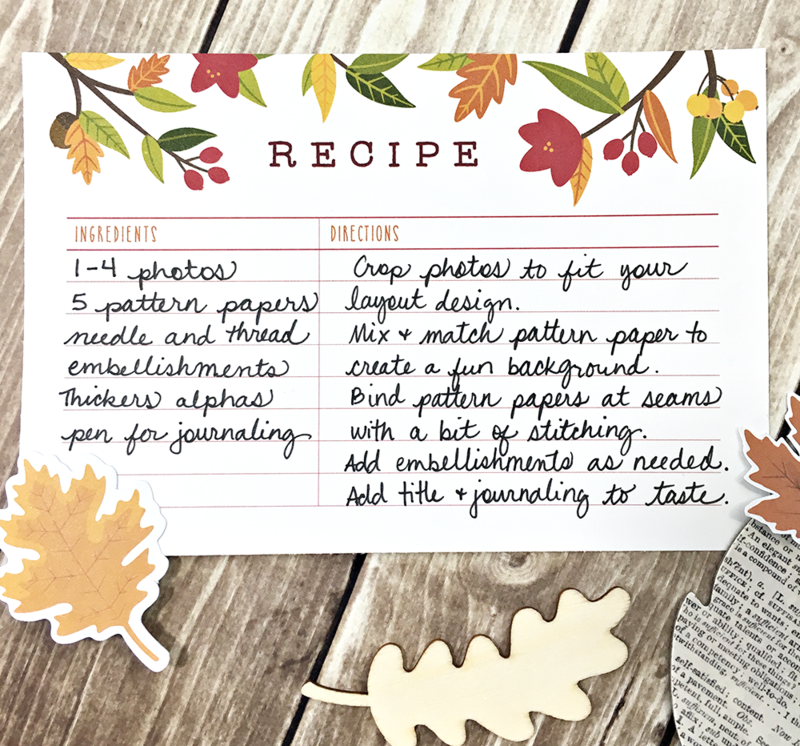 You can add journaling directly to the layout in various ways or you can add hidden journaling on the front or back of the page. You don’t always see it on the layouts I show online but I always add it. Sometimes I like to keep those details private and add them to the layout after photos are taken. Hi everyone, Monique here sharing a “Warm & Cozy” gift box set with you. I don’t know about you, but I never have enough gift boxes (even as I’m writing this blog post I’ve already given two of the three away!). When I saw the new “Warm & Cozy” collection, I couldn’t wait to dig in! I found the warm colors and all the different patterns so very beautiful! 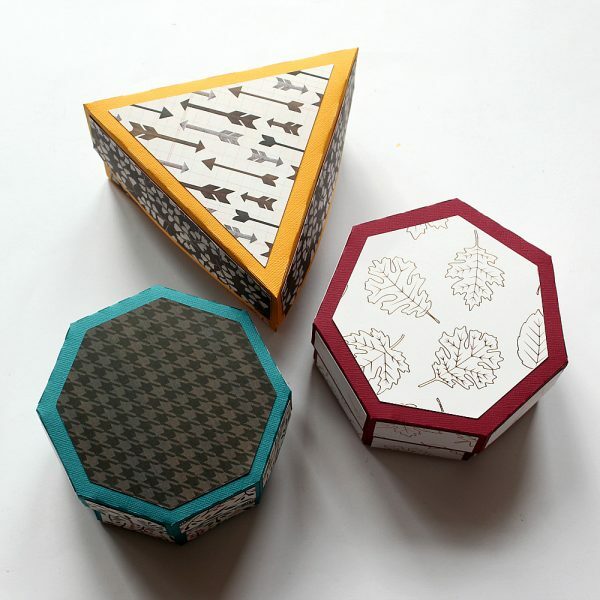 And because I quickly needed two thank you gifts for neighbors who had looked after my house when we were on vacation, I decided to create these quick, yet beautiful gift boxes. For the base of the boxes I chose a digital cut file from the Silhouette store and used my Silhouette Cameo to cut them (bottom right photo). Before assembling the boxes I adhered all the little pieces of paper for the sides and top of the boxes first as this is much easier to do this when the boxes are still lying flat on the table! In case you’re wondering what the sizes of the boxes are, the cut file of the bottom of the blue box fitted exactly on a 12″x 12″ cardstock sheet as did the bottom of the yellow box. The red one is a bit smaller and was cut from a 11″x 11″cardstock sheet. 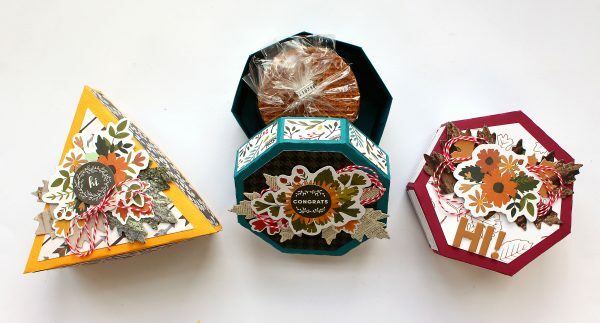 Then came the fun part: the embellishing of the boxes. 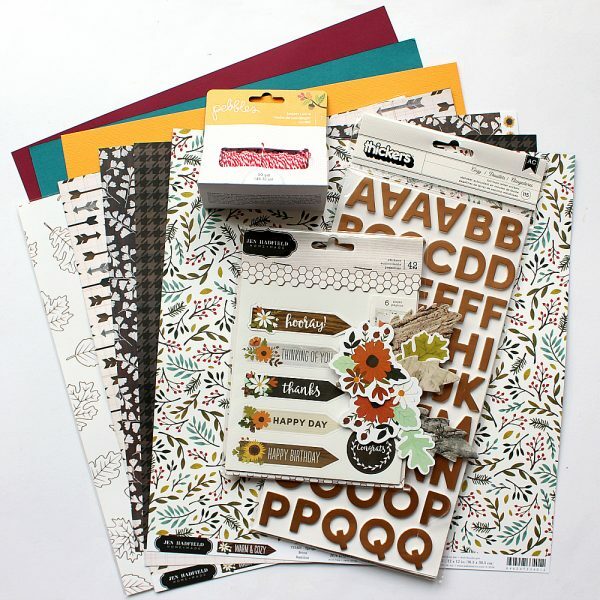 The “Warm & Cozy” collection has so many beautiful chipboards and die-cuts I had a hard time choosing just a few. 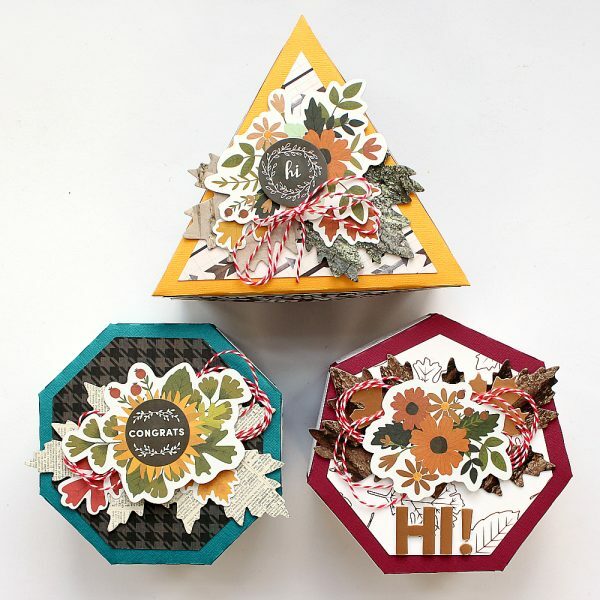 I decided on a uniform look and chose mainly leaves and flowers and a bit of twine for the top of all three boxes. 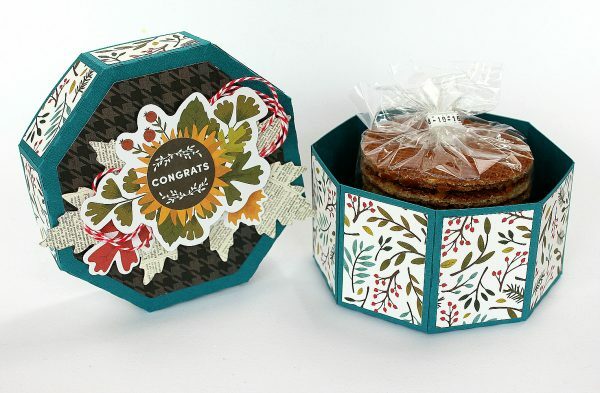 Each “pile” of embellishments consists of: two chipboard leaves with a colored die-cut leave on top, then a piece of twine and right on top a large flower die-cut. The last part was fun too: giving away two of the boxes! 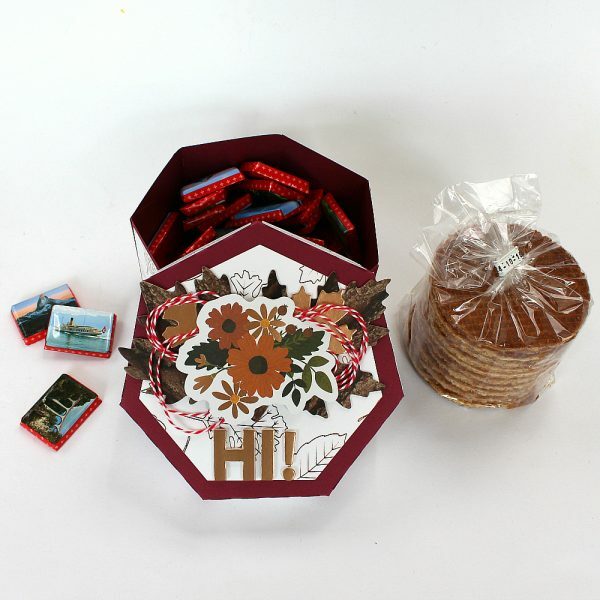 I filled the boxes with a typical Dutch treat: a bag of “stroopwafels” and brought them over to two of my neighbors. I don’t know what they liked best: the stroopwafels or the boxes, lol! Thank you so much for stopping by our blog today! Wishing you happy crafting! Hi everyone. 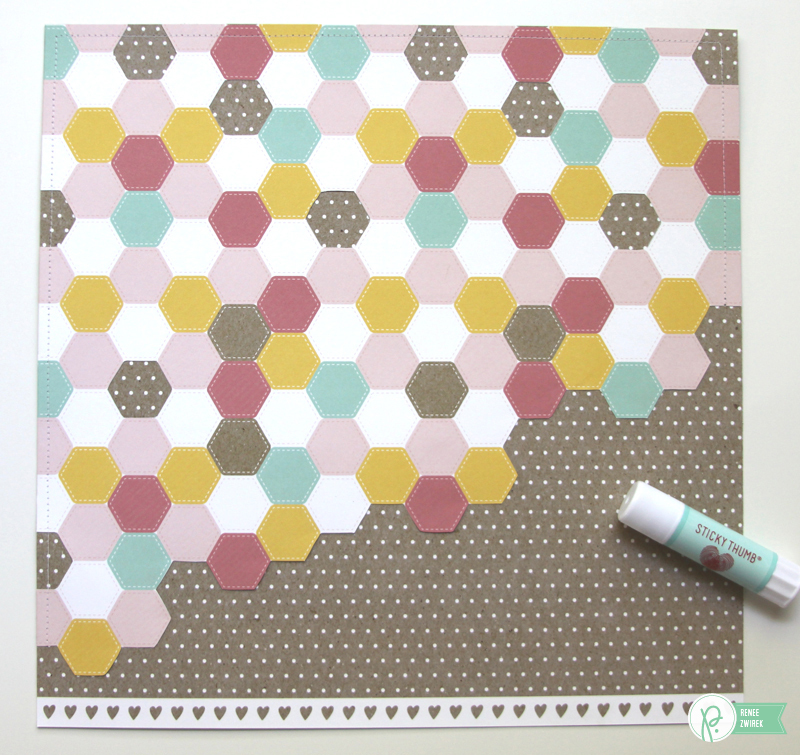 Heather Leopard is here to kick off our Geometric Shapes theme this week here on the blog. 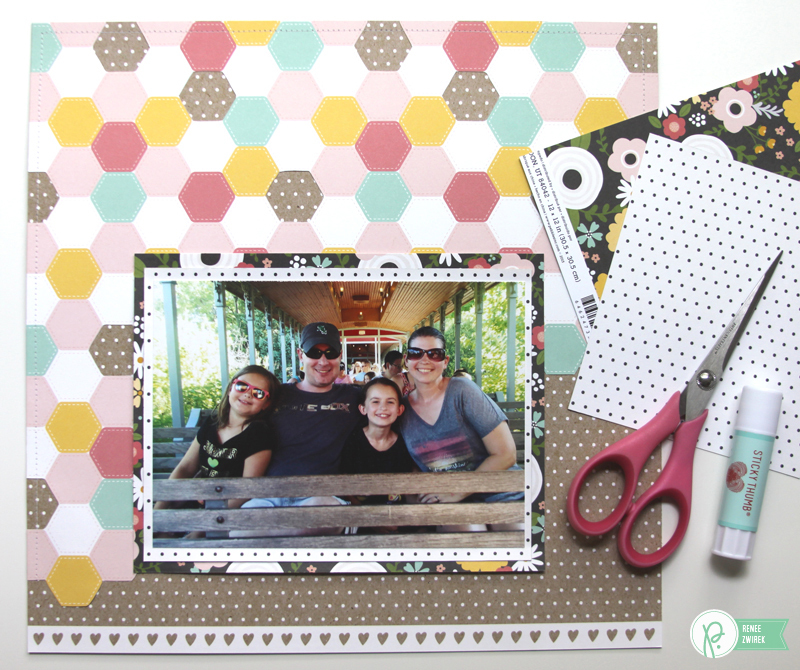 Luckily for me, shapes are my most favorite to work with when creating a scrapbooking layout. I almost always use geometry to create fun backgrounds for my layouts. 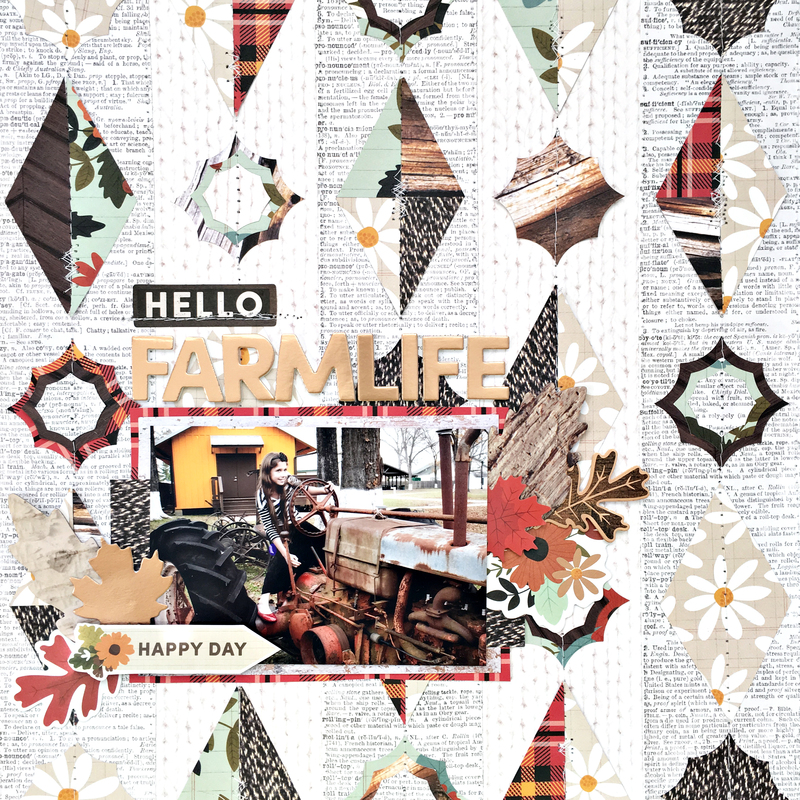 Inspiration for these types of layouts can be found everywhere, from quilts to art posters to this project right here. 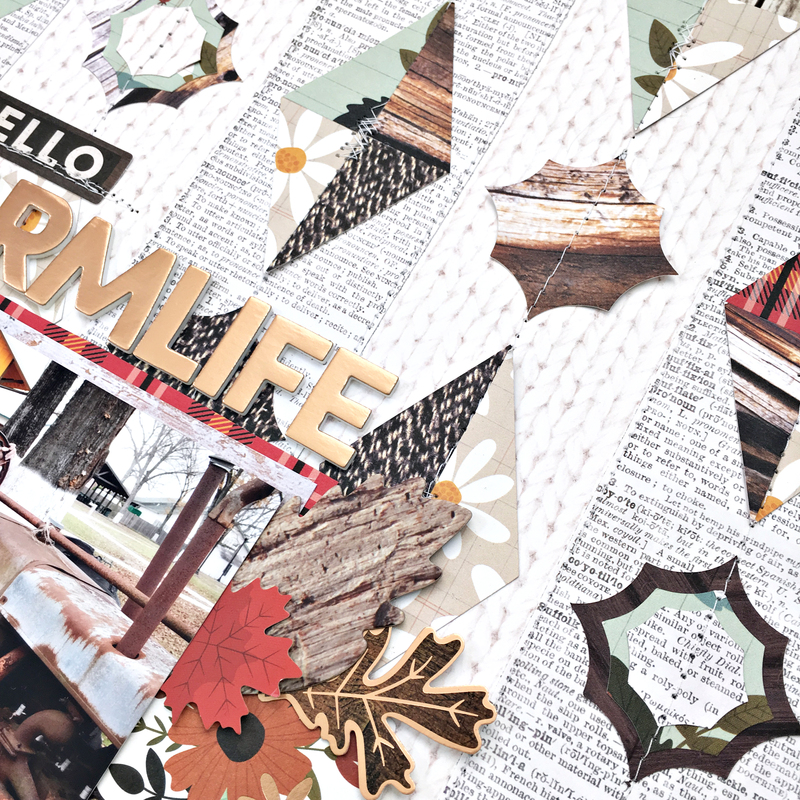 It’s been blazing hot here in Texas so I thought I’d attempt to cool it down a bit by creating a fall layout using the new Warm & Cozy collection. 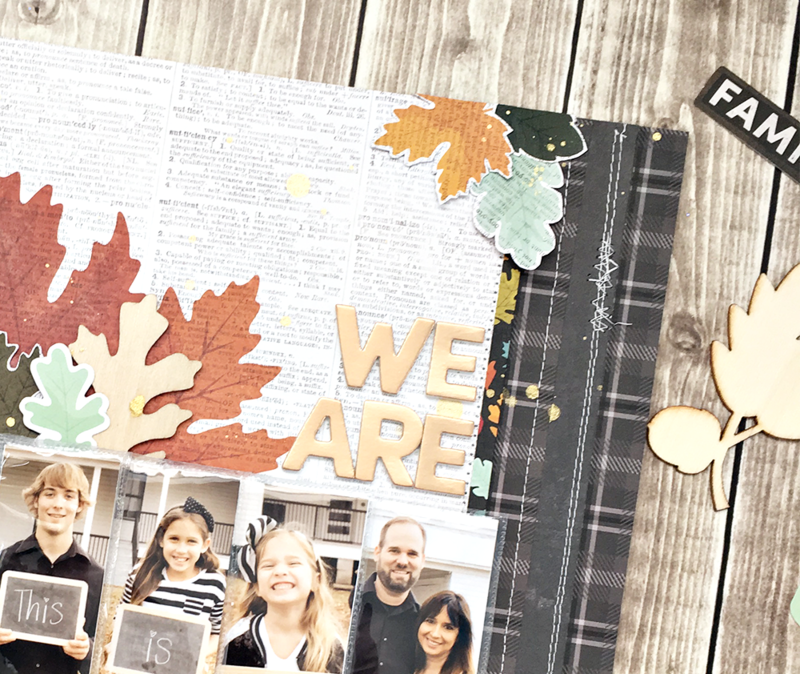 Let me walk you through my creative process for this scrapbooking layout. Choose a light colored background paper. I chose the white Cozy Comfort one that resembles a sweater. 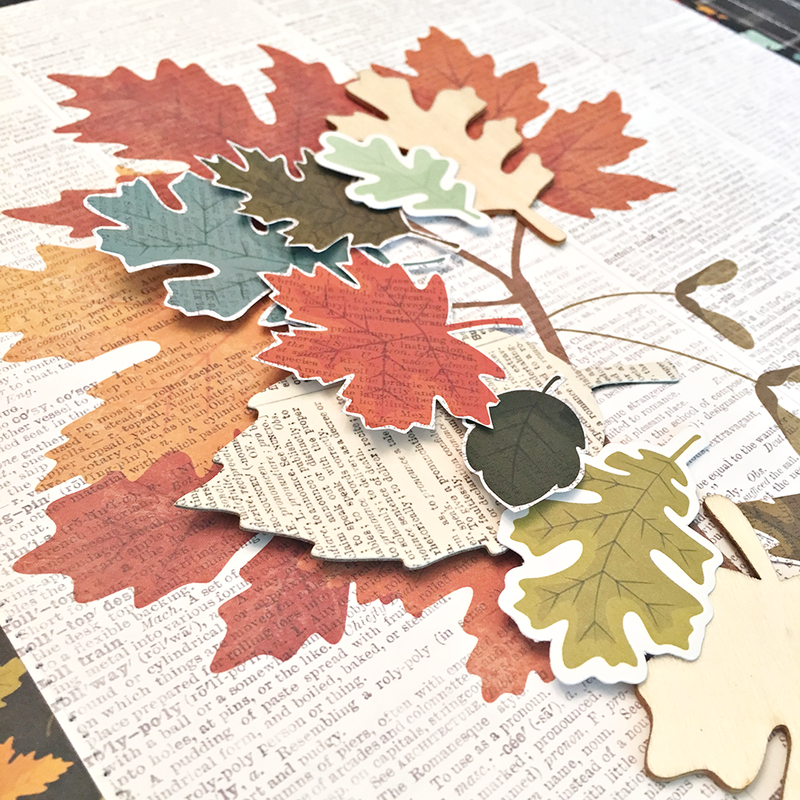 Cut three 2.4″ x 12″ strips of similar pattern papers. 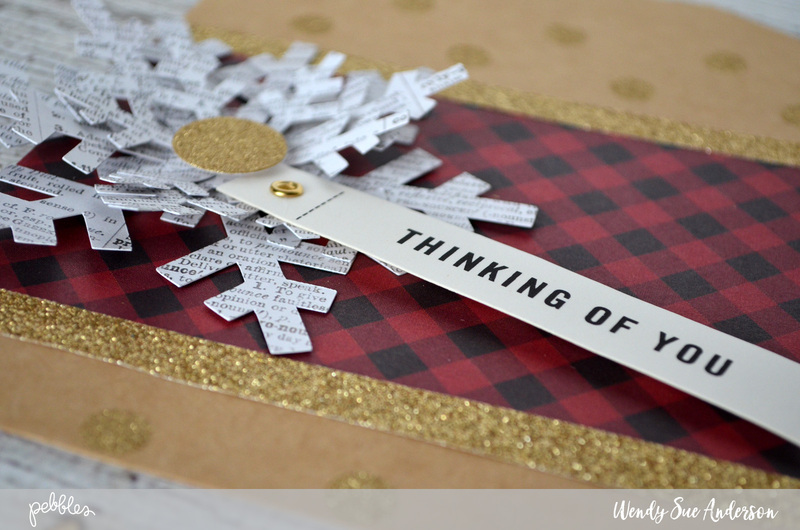 I chose the Tweed paper with text. Stitch the strips to the background creating evenly spaced columns. Download my free Silhouette cut file. 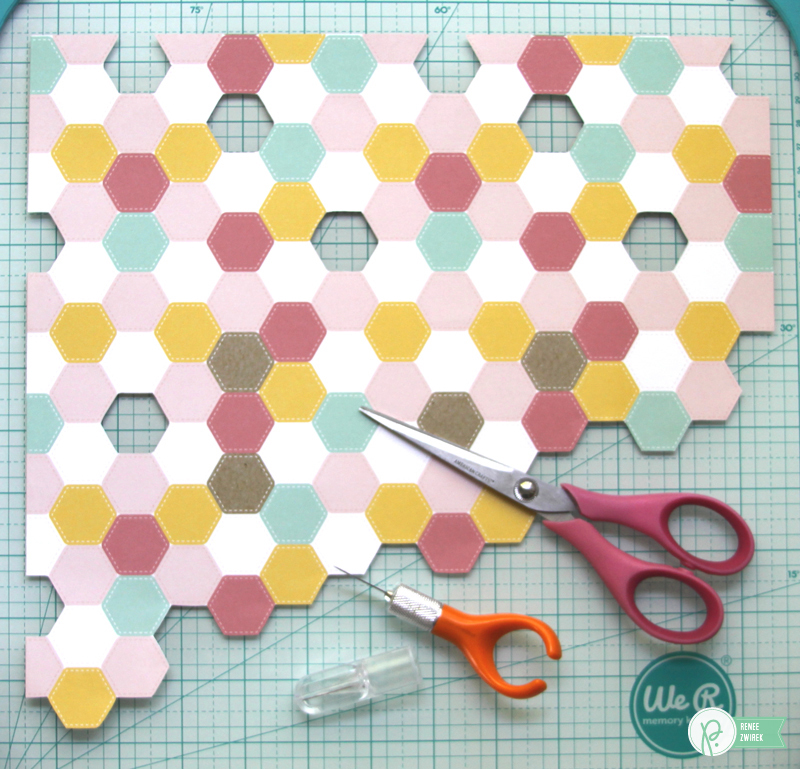 If you don’t have a machine to cut these, simply cut large triangles / diamonds and octagons or circles. Alternate the diamond and octagon shapes so that the top and bottom of your layout always includes a half shape and the inner part of your layout includes full shapes. Adhere with a small amount of adhesive. Once all shapes are in place stitch down the middle of the columns / shapes. Next, I added layers of pattern paper behind my photo, tucking in embellishments here and there. Lastly, I finished it off with a title above my photo and a sentiment at the bottom in one of the embellishment clusters. To complete the layout, I will journal in the open white space just under the photo. 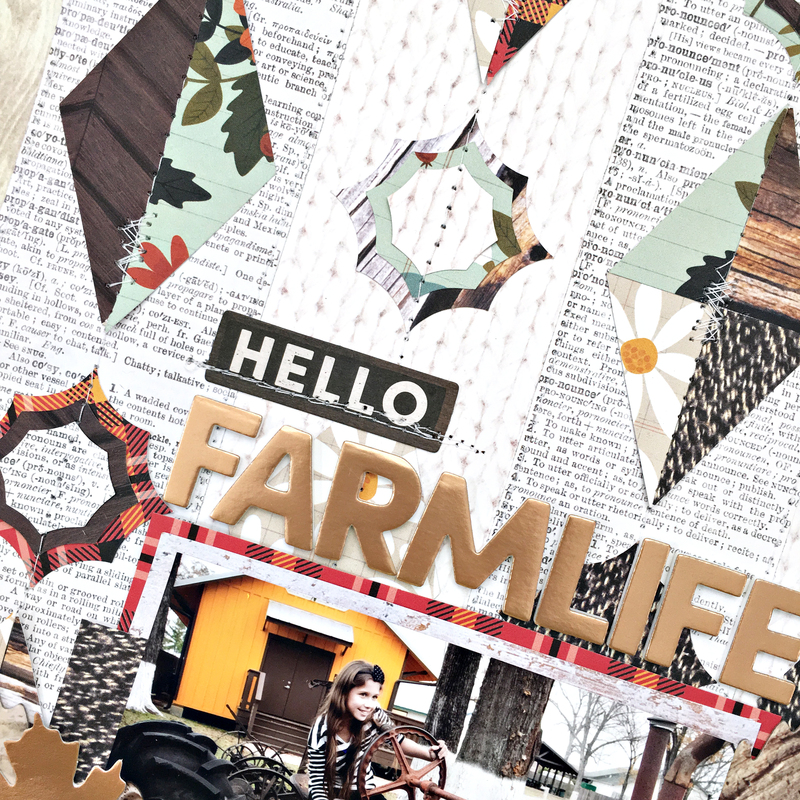 Use a combination of different stitching types to add interest to your layout. Don’t be afraid to add layers of clusters under and around your photo. It helps draw the eye to the photo and can really help compliment storytelling. 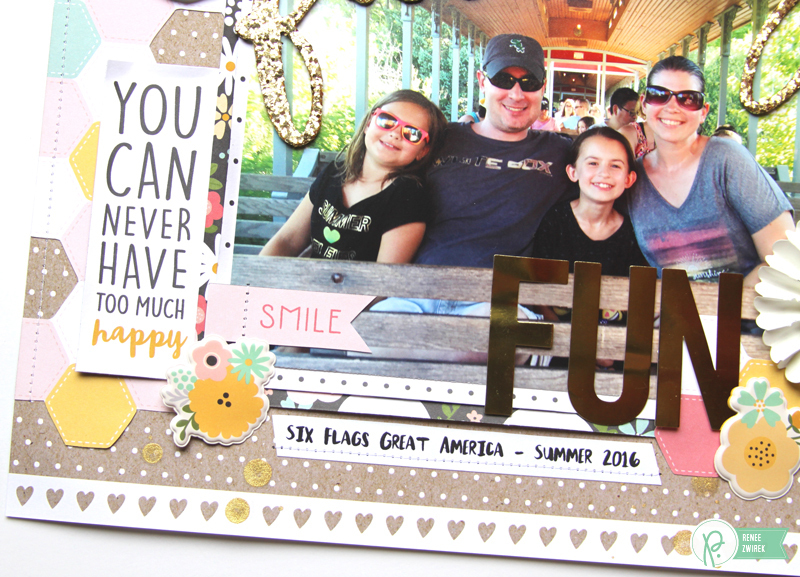 I hope you enjoyed a peek into my creative process for this scrapbooking layout. Don’t forget to download the free Silhouette cut file I created. And if you create anything with it, please share a link to it here or tag Pebbles and me (@heatherleopard) on Instagram so we can ooh and ahh over it! Hi! 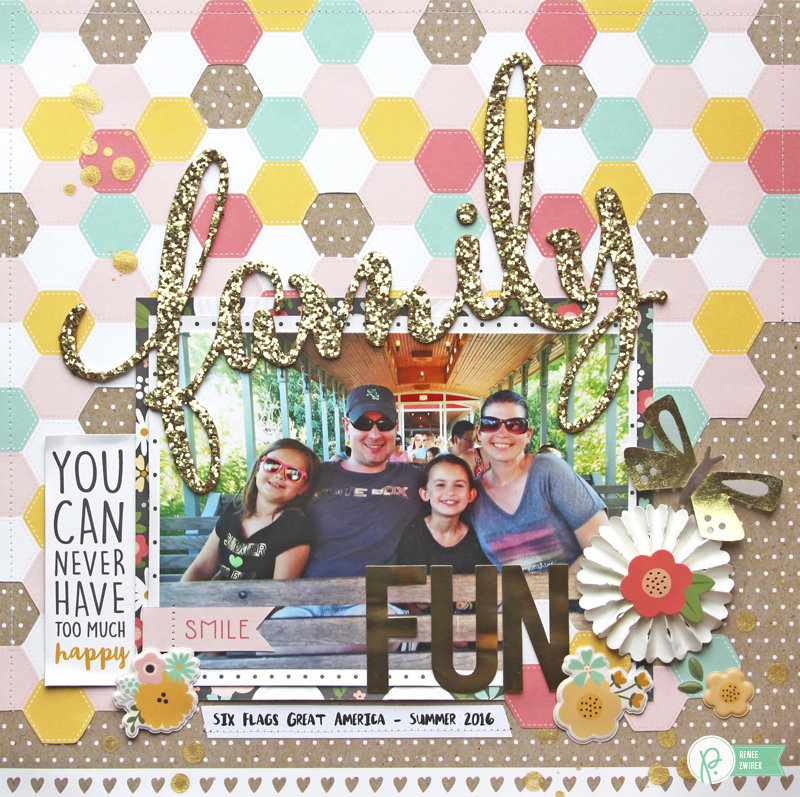 Renee here today to share a Family Fun layout with a big title using the Spring Fling collection. I love summer because we returned to Six Flags Great America. It was an awesome day! Caitie was tall enough to go on all the roller coasters this year. Her favorite ride was X-Flight. Payton had fun riding The Demon for the first time. I took it easy and only rode on a few rides. One of my all-time favorite rides is the train that goes around the entire park. While on the train, we took a family photo and this one has instantly become one of my favorites from our day. 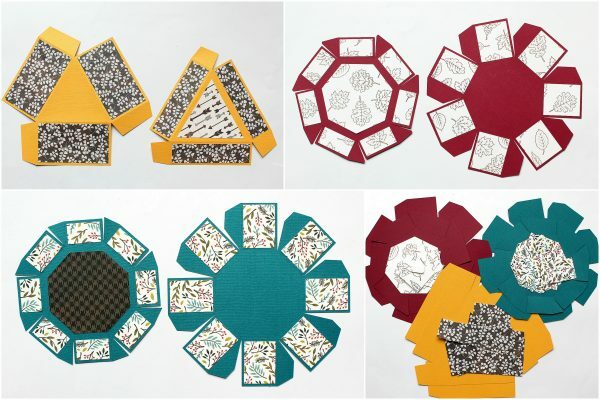 I started this layout by trimming the hexagon pattern on the Patchwork pattern paper. I adhered it to the Lace pattern paper and added some machine stitching. I left the decorative strip on the bottom of my background paper and trimmed off the top instead. My photo measures 5″ x 7″. 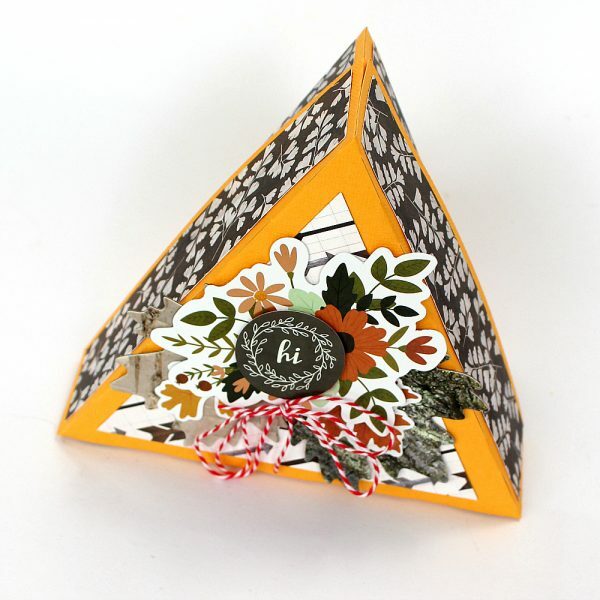 I used both sides of the Chalkboard Floral pattern paper to add some layers. I trimmed the dots pattern to 5 ½” x 7 ¼”. I trimmed the flowers pattern to 6″ x 7 ¾”. 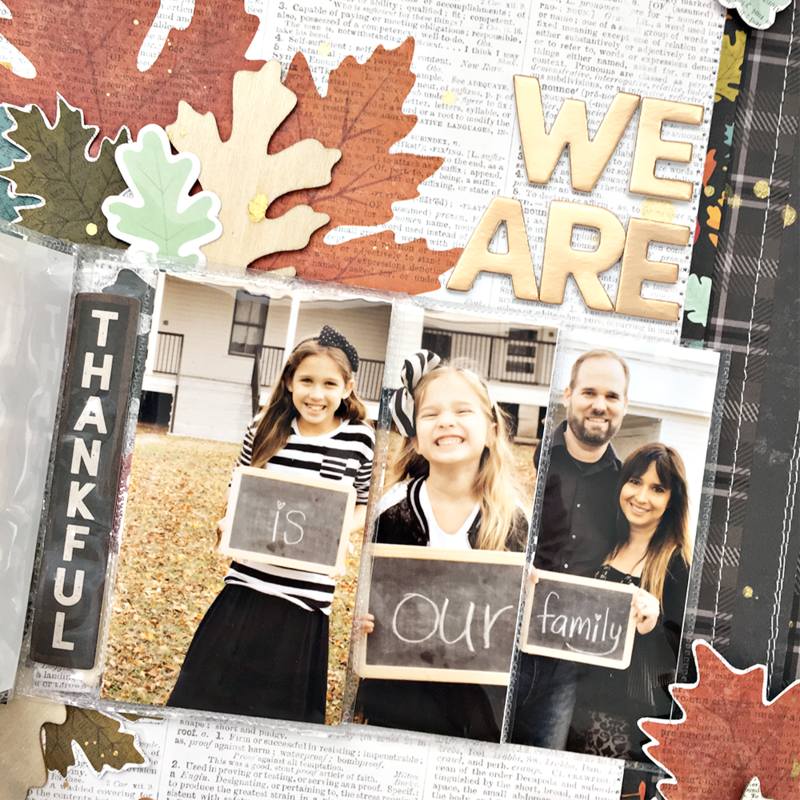 I adhered the “family” Die-Cut Word above my photo and added lots of embellishments. To finish off my title, I used the “FUN” Large Gold Alpha Stickers. I trimmed the “you can never have too much happy” and “smile” phrases from the From Me to You pattern paper. I added a few Puffy Flower Stickers. 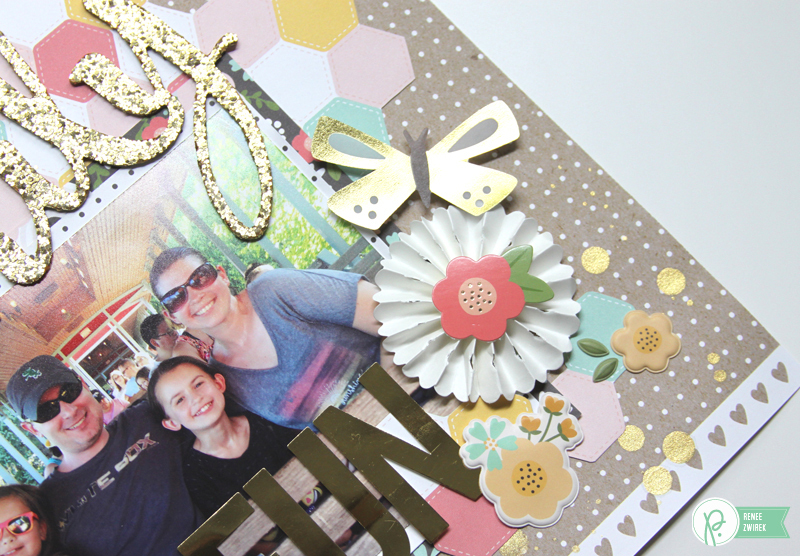 I added a gold butterfly Vellum Die-Cut, a Rosette, and a few more hexagons here. I added some Golden Color Mist to finish off the page. 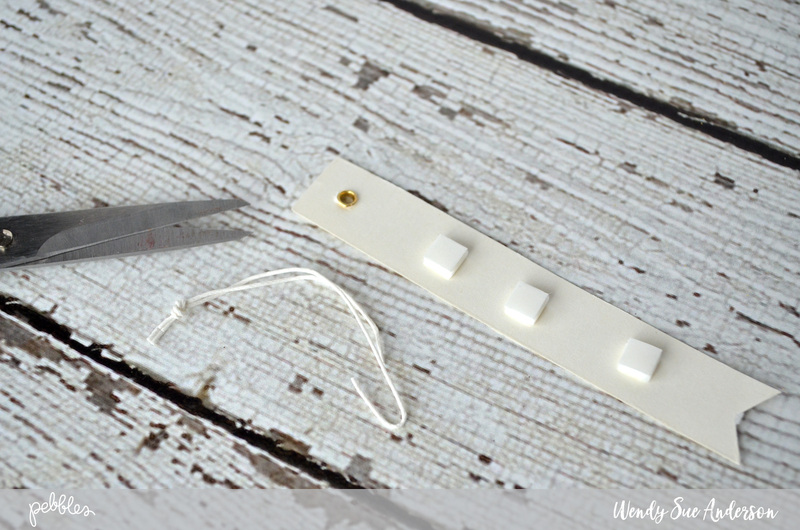 Thanks for stopping by the Pebbles blog! 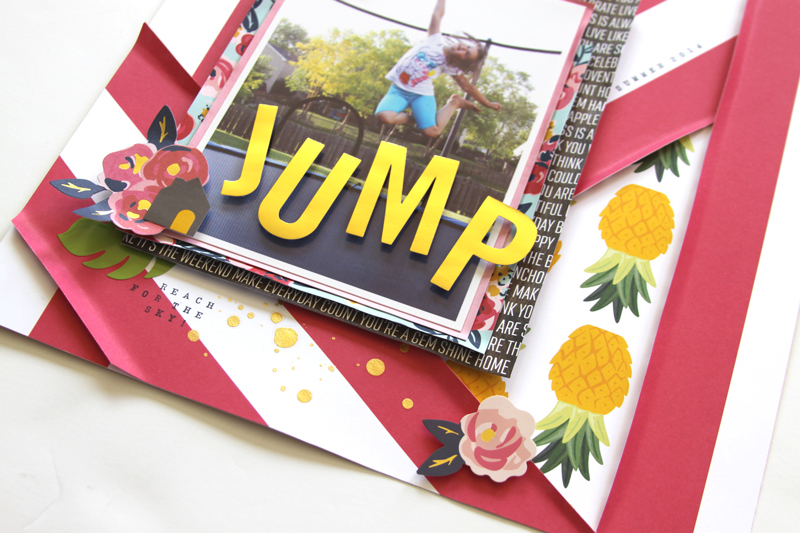 For another project with a big title, check out my Jump Layout along with the video tutorial.